On Saturday I debuted my W.C. Fields History Walking Tour as part of Fields Fest, a 6-week celebration of the life of the great comedian. Dorothy Parker was a huge fan of Fields. In my book The Algonquin Round Table New York: A Historical Guide, I was really happy to be able to include a photo of Parker and Fields together. 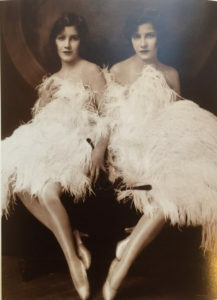 One of the parts of the tour I wanted to do, but didn’t for the sake of time, was to read a little of what Parker wrote in 1918 about Fields, who was in the Ziegfeld Follies at the time. The review has everything I’m a fan of: Dorothy Parker, of course. The Follies. The Jazz Age. World War I. And of course, the lost history piece. I included this review, and 49 others that had been lost, in Dorothy Parker Complete Broadway, 1918-1923. It’s the only collection of her Broadway reviews, and I was thrilled to be able to edit it (and write the notes and comments section). Here is Parker’s review from Vanity Fair. One sweetly solemn thought comes to me o’er and o’er—“Can they ever produce a revue when we get through with the war?” I brood over the thing practically without ceasing, but I can find no answer to it. I can see no future whatever for our musical entertainments once peace is declared. How will they ever costume the show-girls if not in the flags of the Allies? What will the prima donna do if she can’t appear at least once as Columbia? How will they ever get the curtain down if it can’t fall on a finale of the tights of all the Allies? What will they do for the big scene, if they can’t use the Lee Lash trench with Our Boys—all exempt—gazing manfully out into the wings, over the property sandbags? The thing is too much for me. I don’t see how the managers are ever going to get along without a war somewhere around. Look at this year’s Follies, for instance. Where would they be if there hadn’t been the Allies to fall back on? Why, Echo doesn’t even answer. The audience staggers out of the New Amsterdam Theatre, all used up with patriotism, muscle-bound from applauding Dolores swathed in the stars and stripes, and Kay Laurell simply gowned in the French flag. 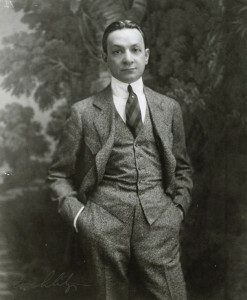 Florenz Ziegfeld, Billy Rose Theatre Division, The New York Public Library. “Florenz Ziegfeld” The New York Public Library Digital Collections. Every few minutes there is a parade of most of the beautiful women in the United States, dressed in what comes under the head of uniforms; or a song about the Blue Devils; or a trench scene; or a Ben Ali Haggin tableaux; or a finale of the Allied color bearers. It is charming to hear the buzz of spirited argument, during the finale, as the audience tries to settle which flag belongs to what Ally. Everything is fair enough, of course, when they are dealing with France, England, Italy, and Belgium; but it does get a bit thick when they start bringing in the colors of Montenegro, Portugal, and Serbia. There is one great moral lesson to be derived from the Follies and that is this: if we must have our patriotic spectacles of an evening, Mr. Florenz Ziegfeld, Jr., is unquestionably the man to produce them. 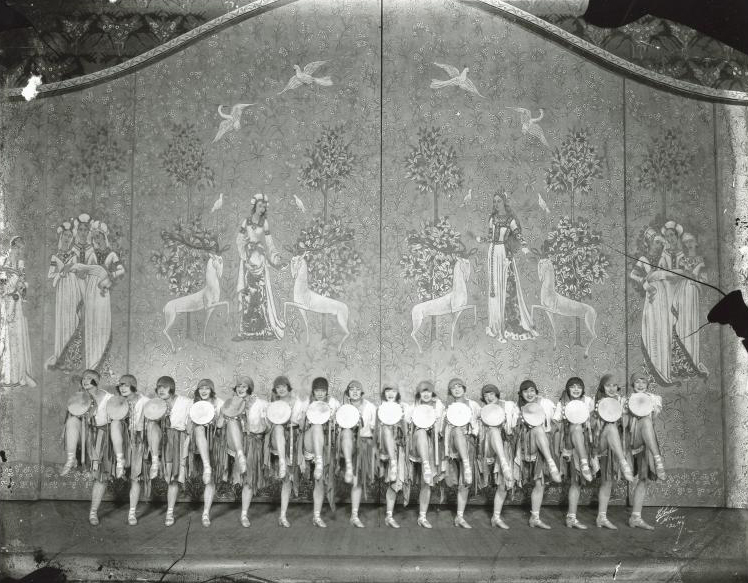 Any more dazzling stage pictures than those which go to make up the Follies, I have never beheld. They deserve every word that the advertisements say of them, and more besides. And I never knew there were as many pretty girls in the world as they are gathered together on the New Amsterdam stage; really, I saw so many beautiful women in the course of that one evening that it was a positive relief to go home and look in the mirror. Joseph Urban’s scenery, combined with Mr. Ziegfeld’s flawless taste in women, make the evening one long delight to the eye. But the Follies of 1918 are certainly meant to be seen and not heard—even the amalgamated efforts of Louis Hirsch, Dave Stamper, Irving Berlin, and Victor Jacobi can’t make you remember a single song five minutes after you’ve heard it. Most of the numbers are entrusted to Lillian Lorraine, who is easier than ever to look at and harder than ever to listen to—something really ought to be done about those high notes which she insists upon taking at the end of every song. After spending almost an entire evening in listening to her sing, I can’t understand why she doesn’t go into the movies. Marilyn Miller sings a bit now and then, although most of her time, fortunately, is spent in dancing. Whenever she starts to dance, I know I’m going to have a good time. Even when she goes in for ballets I am still with her, though I can’t exactly get up on my seat and cheer about it. The distaff side is further represented by Allyn King, the Fairbanks Twins, and Ann Pennington, who has discarded her Hawaiian costume—probably to conserve wheat—but whose dancing is as unhampered as it was in her hula-est days. The life of the evening is Will Rogers, who, to me, is one of the Greatest Living Americans. But they don’t do the right thing by him. There is a horrible stretch of time when they make him play the rôle of Satan in an unbelievable scene supposed to represent the lower regions on a busy day. I am doing my utmost to forget that sketch—all those concerned in the writing, producing, and casting of it ought even now to be showing cause why sentence of twenty years’ imprisonment should not be passed on them. When they let Will Rogers alone, however, he is as good as everyone expects him to be. 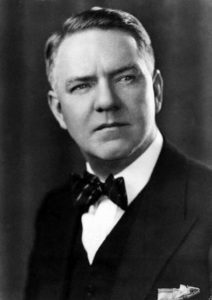 Eddie Cantor, too, works valiantly, and W.C. Fields, who is playing golf this year, and Harry Kelly add much to everybody’s happiness. Savoy and Brennan—I have never been able to ascertain whether it’s Savoy or Brennan who impersonates the perfect lady, but whichever one he is, he’s my favorite actress—do their bit late in the evening, and Frisco, recruited from the Roof, dances for a brief interval. Two sadly empty chairs at the fireside are those for Bert Williams and Fanny Brice, who are conspicuously absent from the cast this season. There are those who go about insisting that Hitchy-Koo 1918 is the greatest show on earth; but to me, seeing it was like hearing a very good story told the second time. All the principals do just what they did last year, even to Irene Bordoni’s rendering of “For Me and My Girl” in French. Of course, I had only a sketchy idea of what happened on the stage, which may have tended to bias me. On the night that I was present at the Globe Theatre, the seat immediately in front of me was generously filled with one of the largest women in the Middle Atlantic States. It was physically impossible to see over her, and it was almost as bad trying to peer around her flank movements. When I leaned over to the right, she would immediately sway in the same direction, and when I desperately tried the other side, she would instantly list comfortably over to the left. In fact, she had me stymied during the entire evening. But, no matter what the show may be, if Raymond Hitchcock is in it, it’s a success. He runs at top form from the moment he clubbily makes his appearance in the orchestra, welcoming the incoming audience, to the final thud of the curtain. He completely wins the audience’s collective heart early in the evening by stopping a tenor solo that is going on, explaining that he owns the whole darn show, and he isn’t going to have anything like that in it. Miss Ray Dooley gathers in a large share of the laughs of the evening, particularly in one delicate scene where she plays an obstreperous baby whom Mr. Hitchcock, as the proud father, silences with a blackjack. She is extremely clever as an infant—and anyway, even though I do wear shell-rimmed glasses on occasion, there is always something about a gentleman hitting a lady over the head with a stuffed club that causes me to rock with happy laughter. Miss Dooley’s second big moment is in a kitchen scene—a scene with the subtle, suave quality of the Keystone school—where she plays a kitchenmaid to Leon Errol’s rôle of inebriated chef—I wondered how on earth he going to work in his perennial drunken dance, and this is where he does it. There is a great deal of falling, one way and another, in Hitchy-Koo. Leon Errol falls with customary frequency, and Ray Dooley loses her balance every few minutes, and Roy Cummings comes out in front of a curtain and falls on and off the stage for what seems like weeks at a stretch, although I don’t suppose it actually lasts more than an hour and forty minutes. To me, next to the dancing of Florence O’Denishawn, who slipped quietly out of the West without even a few kind words from a press agent, the big event of the evening was Dolores, a lean gray horse of terpsichorean tendencies, played by William Holbrook and Roy Binder. But that, of course, is just a little personal matter, and you can’t account for those things. I was delighted, too, to hand it to the chorus, who fully live up to the advertisements of “a chorus of forty under twenty,” —in most of the season’s musical shows, it has been just vice versa. There is a great dearth of chorus men in the production. I suppose what with the draft, and the anti-loafing law, it must be exceedingly hard to get chorus men these days. I hate to resort to the old one—but I wish to heaven it were impossible. There is this about Hitchy-Koo, though. It is mercifully far-removed from the war. In fact, one comes in contact with it only in Irene Bordoni’s French marching songs, and in another song called “It Will All End Up With the Right End Up.” I thought that was going to be a good song, too, and then they went and rhymed “time” and “Rhine,” and spoiled everything. Like the Follies, Hitchy-Koo is in desperate need of a few good songs. Will someone kindly page Mr. Kern? Patriotism simply runs wild in the Midnight Frolic. It makes the audience bang lustily with their hammers on the tables, feeling, with a glow of contentment, that they are thus helping to win the war. It inspires most of the songs and costumes; and it culminates in a series of remarkably beautiful tableaux, arranged by Ben Ali Haggin. By use of gauze stretched over the frame he gains a curiously flat effect, so that each tableaux looks like a painting, and entirely does away with the usual impression of a “living picture” of a wobbling showgirl balanced inside of a property frame. The Frolic is fortunate, too, in having as its single scene an Urban setting of real birches against a deep blue sky. 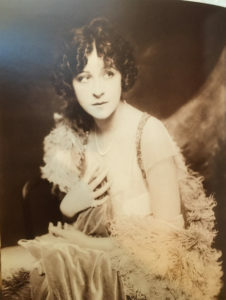 Fanny Brice, more unlike her imitators than ever, does two of her songs, and the Six Brown Brothers saxophone the audience into a general state of well-being. The woman at the table next to me pointed out to her friend that it must be a terrible undertaking to keep all of the complicated ins and outs of a saxophone shining so dazzlingly—this effectually deleting the joy from my life, for I couldn’t think of anything else during their entire act. I wish at least one Brown Brother would put me out of my misery by explaining who valets his saxophone, and what they do with it, and how long it takes to do it. The job of saxophone-cleaner heads the long list of Positions I Would Not Want to Fill. Frisco dances as entertainingly as he has been all winter, and Lillian Lorraine, who just doesn’t know what to do to kill her evenings, comes up from the Follies downstairs to sing a song in a flower-twined swing, in which she floats far out over the silver fizzes of the ringside tables. She later on renders a timely ballad about “Hello, Springtime,” and, game to the last, concludes the evening dressed as Joan of Arc, singing one of those songs about “V is for vim. I for independence,” and so on, the dénouement being the word “v-i-c-t-o-r-y” disclosed by faultless spelling. In the Century Grove, on the roof of the Century Theatre, everybody is steeped in patriotism, too. Mr. Gest and his happy family can’t do any tableaux of the Allies because the Frolic got there first, so they content themselves with one little song which introduces the girls of the various Allied nations; and, for tableaux, they do heroines of American history, with charmingly novel effects. You just ought to see how blonde Barbara Frietchie’s old gray head is, and how the glycerin tears shine on Clara Barton’s cheeks! In the pauses between the waving of the flag, the Dolly Sisters dance, helping the evening along considerably, and Sybil Carmen, Arline Chase, and Frances Pritchard divide the remaining honors. I don’t want to appear super sensitive, but I could manage to struggle along without Loretta McDermott’s jazz dance, which she does in male habiliments, smoking a large black cigar the while. When Frisco does it, I think it’s great; but, strong that I am for the single standard; I really must admit there are still a few things that women can’t get away with—neatly. Gordon and William Dooley tumble around the Century Roof even more enthusiastically than their sister Ray does over at the Globe. What a nice, quiet little family the Dooleys must be when they are at home! I have never been able to find out for certain, but I have a strong, deep-rooted suspicion that they are the people who live in the apartment over ours.